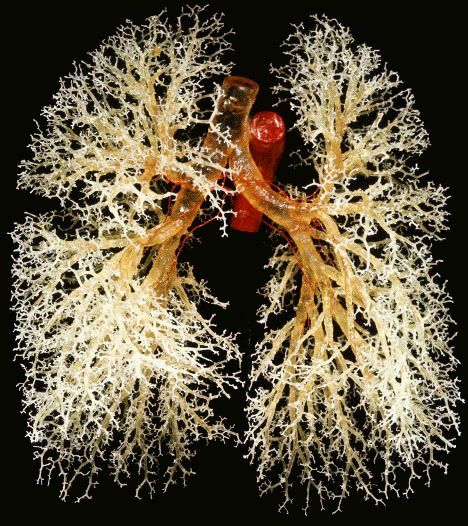 Bronchi, branching from the trachea, are the primary passageway for air to get into the lungs . It is the plural for bronchus. Each bronchus further branches into smaller tubes or bronchioles. There are two primary (extrapulmonary) bronchi – the right and left main bronchi that connect the trachea to the two lungs . 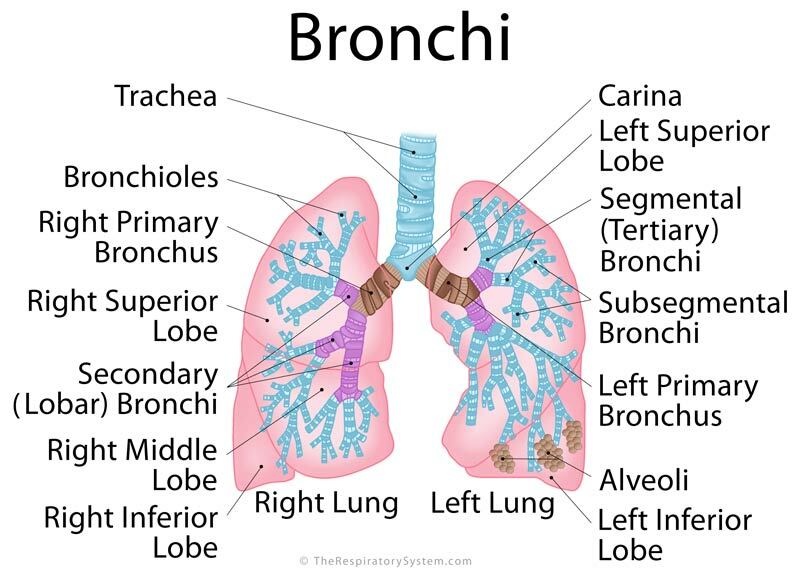 The bronchi are located in the thoracic cavity  along with the trachea and lungs. It originates from the lower end of the trachea or windpipe, where it divides or bifurcates (at the point of carina) into the left and right bronchus . The branch that leads into the right lung is called the right main or primary bronchus . Being about 2.5cm long, it is shorter than the left primary bronchus, but wider in diameter . It enters the right lung at around the level where the fifth thoracic vertebra is located . The right primary bronchi branches into three secondary or lobar bronchi, the superior (upper), middle, and inferior (lower) lobar bronchi. The right superior secondary bronchus is also known as the eparterial bronchus because it is the only bronchial tube originating above the pulmonary artery’s level . 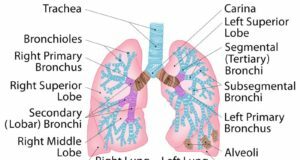 Bronchial lymph nodes are located at the origin point of each of the lobar bronchi . The main bronchus first divides into the right superior lobar bronchus and bronchus intermedius, with the latter then giving rise to the middle and inferior bronchi . The secondary bronchi then further subdivide into ten tertiary or segmental bronchi. . These tertiary bronchi then give rise to the subsegmental bronchi, which then leads to the smallest branches of a bronchus, the bronchioles . The azygos vein overarches the right primary bronchus from behind, at the base of the lung . The left primary bronchus supplies air to the left lung  and is around 5cm in size, twice as long as the right main bronchus . It enters the left lung at around the level of the sixth thoracic vertebra, passes from beneath the aortic arch, crossing the esophagus, thoracic duct, and descending aorta from the front . Like the right main bronchus, the left one also divides into two lobar bronchi, the superior and inferior lobar bronchi . The lobar bronchi then subdivide into eight tertiary or segmental bronchi [9, 12]. The tertiary bronchi continue to divide into smaller tubes to become subsegmental bronchi and then bronchioles . Like the trachea, the bronchi are also surrounded by c-shaped cartilaginous rings . However, the smaller bronchial tubes have irregular cartilaginous sheets instead of rings to support them. 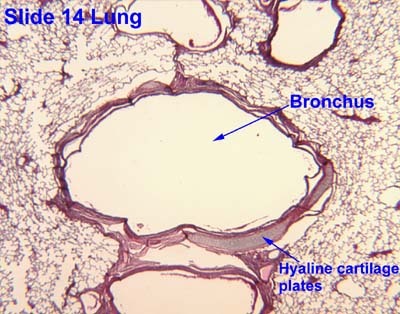 These cartilage structures, along with a layer of smooth muscle bands, control the diameter of the lumen of the bronchi during inhalation and exhalation [2, 15]. The inside walls (luminal surface) have a mucus membrane lining and hair-like projections called cilia  covering them. Though not as many as in the trachea, the bronchial epithelium also has goblet cells to secrete mucus that protects the mucus lining . The outer bronchial walls are covered in a band of adventitia that acts as a connection between the bronchi and the other tissues of the lungs . 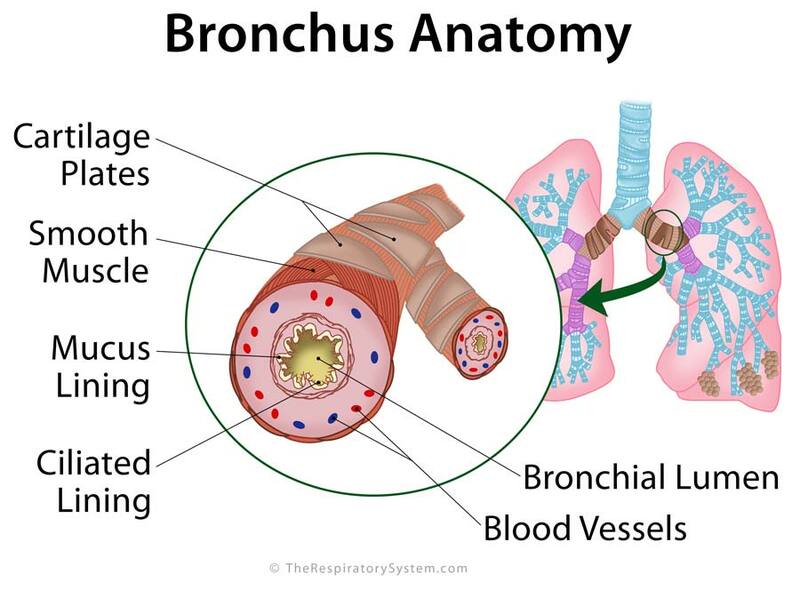 The main function of the primary bronchi is to carry oxygen-rich air reach the lungs during inhalation and let carbon dioxide-rich air out of the lungs and into the trachea on its way out during exhalation . It is the connection between the rest of the respiratory tract and the lungs. Its cartilaginous walls help in maintaining its shape during breathing, preventing it from collapsing, while the mucus lining, along with cilia keeps any foreign particles (like dust) from entering the lungs . The smaller tubes of bronchi are assigned to supply specific regions within the lungs. The three secondary or lobar bronchi of the right lung act as the passage for air to the superior, middle, and inferior lobes of the right lung. There are only two secondary bronchi in the left lung as there are only two lobes to supply, the superior and inferior lobes . These supply air to the bronchopulmonary segments. There are ten bronchopulmonary segments in the right lung, so it has ten tertiary bronchi , while the left lung has eight tertiary bronchi to serve each of its eight bronchopulmonary segments [1, 20]. These small tubes are responsible for letting the inhaled air reach the alveoli through bronchiole, where the exchange of oxygen and carbon dioxide occurs. Bronchitis: Inflammation of the bronchial tube linings, bronchitis can be either acute or chronic with symptoms including a cough, shortness of breath, wheezing, and fatigue. Severe symptoms along with chest pain and high fever may even indicate pneumonia . Bronchitis may occur after severe flu, or due to excessive smoking and certain environmental factors . The acute form usually goes away on its own after a few days, which severe or chronic cases may need medications and breathing exercises along with a healthy lifestyle . Bronchiectasis: Characterized by chronic dilation of the bronchi and bronchioles which leads to excessive mucus discharge, increasing the risks of serious lung infections. Persistent cough, phlegm discharge, and breathlessness are the common symptoms of this condition . Treatment involves medication, breathing exercises and special devices for getting rid of the excess mucus and managing the bronchial dilation, while an infection may require antibiotics . Asthma: A common condition primarily affecting the smaller tubes of bronchi, it is characterized by breathing difficulty, wheezing, and a tightness in the chest . It causes the smooth muscles to contract, narrowing the airways (bronchial spasms) , and leading to the symptoms. Treatment and management include inhalers and medications to open up the airways, as well as avoiding the triggers, including smoking, eating certain foods, and going near allergenic animals . Tuberculosis: A bacterial condition that usually affects the lungs, tuberculosis may also occur in the bronchi and trachea in some cases, leading to fatigue, fever, cough, and bleeding from the bronchi and trachea . Cancers: Lung cancer and bronchial adenoma are two of the cancer types that may affect the bronchial tubes. There may be different types depending on origin and growth of the tumor, including bronchogenic carcinoma (originates in the bronchi or bronchiole epithelium)  and adenoid cystic carcinoma (arising from salivary glands in the throat and mouth) . Diagnosis involves various medical procedures like a CT scan, MRI, bronchoscopy, and biopsy . Surgical repair of the affected bronchus (bronchoplasty)  may be considered in some cases.